Good morning, everyone! 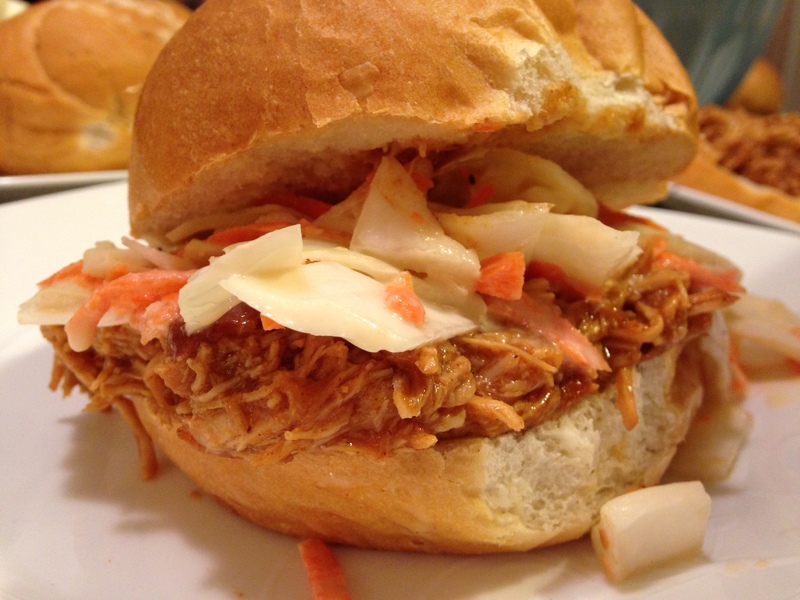 Today I’m writing about my attempt at making coleslaw for my pulled chicken sandwiches. 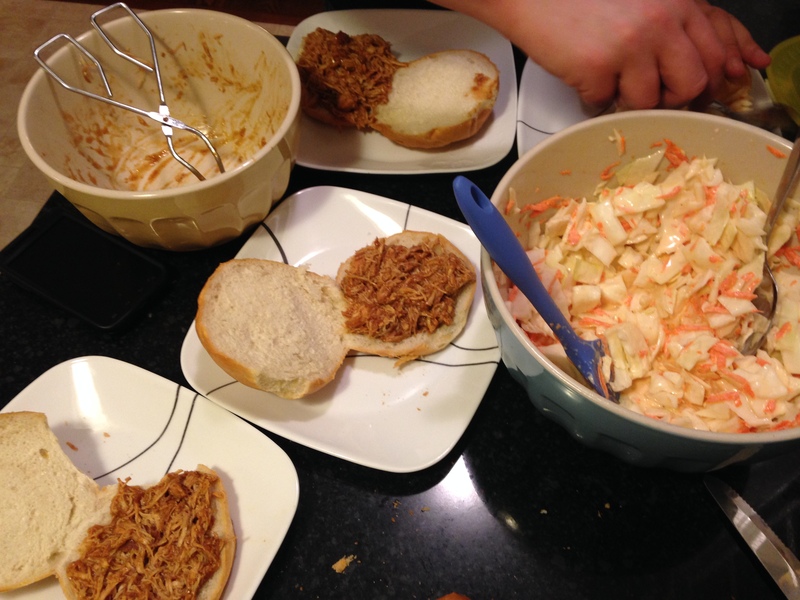 We had never had the sandwiches with coleslaw, but the thought of the possibility was always there. Naturally, I searched Pinterest and found what I was searching for. 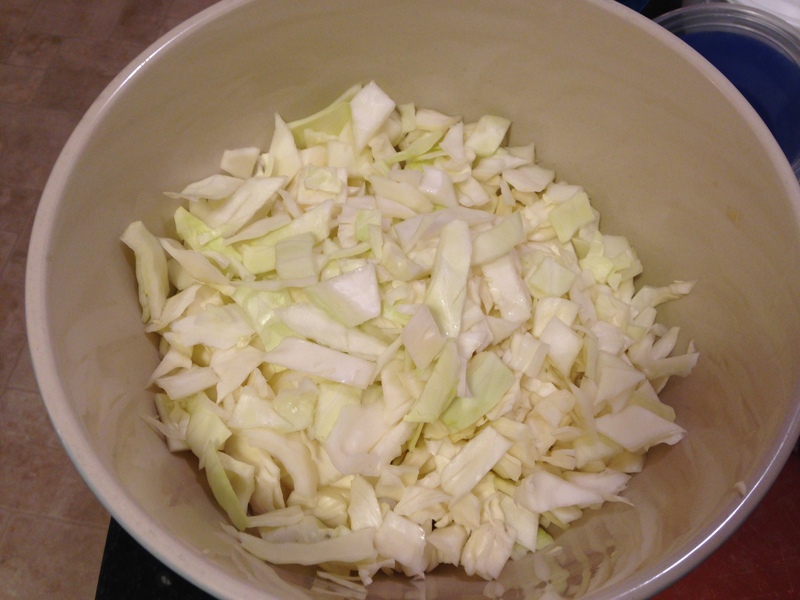 In retrospect, I realize that I did not chop the cabbage fine enough. 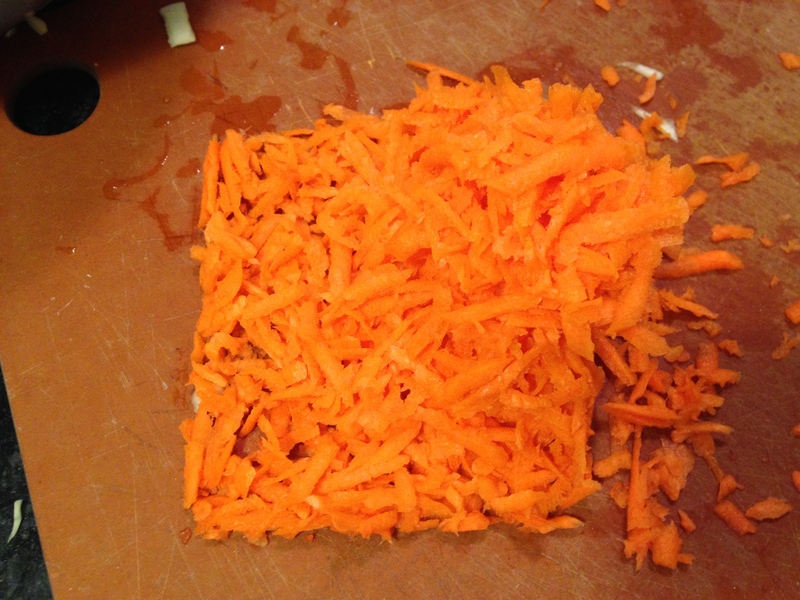 It still turned out tasty, but next time I’m definitely chopping it finer, or perhaps shredding it, as well. You will probably notice the hand in this photo. It was my 4 year old son asking “What are you doing with this stuff?” He didn’t give me the chance to explain, he just ran back to the living room. 1. 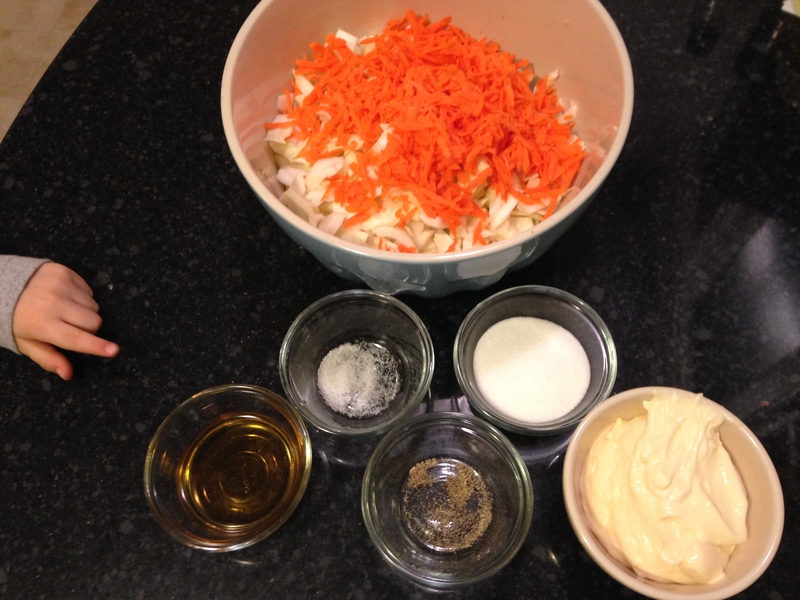 Mix ingredients. Ta da! 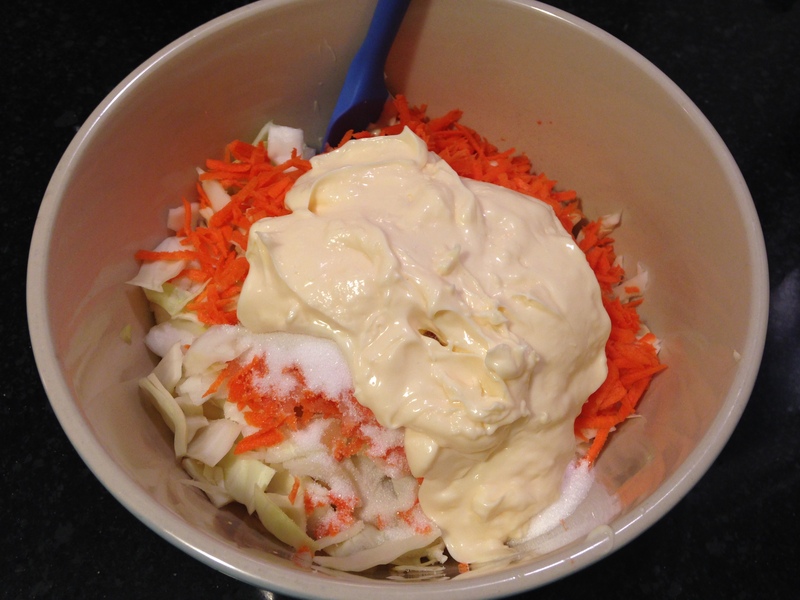 *The recipe called for the mixture to be refrigerated for several hours before serving, but I did not have the luxury of time, nor had I given this any forethought, so I served it right away. 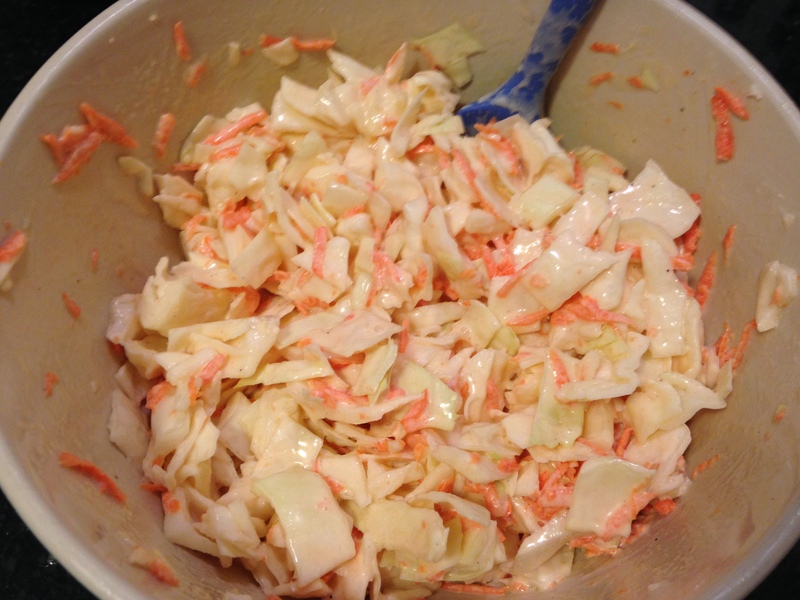 This is when I made my sandwiches and added the coleslaw inside. 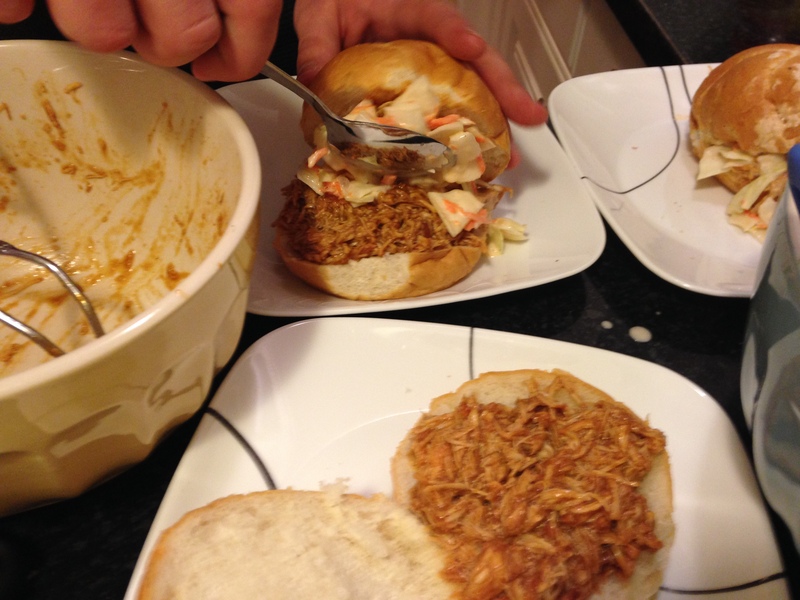 I am not ordinarily a coleslaw ‘person’, but when it came to this particular meal, I greatly enjoyed the crunch and fresh taste of the coleslaw with the savoury pulled chicken. This was a hit! Thank you so much for reading! Stay tuned for my upcoming blog that looks at how I write. Happy Wednesday! Hello blog readers! 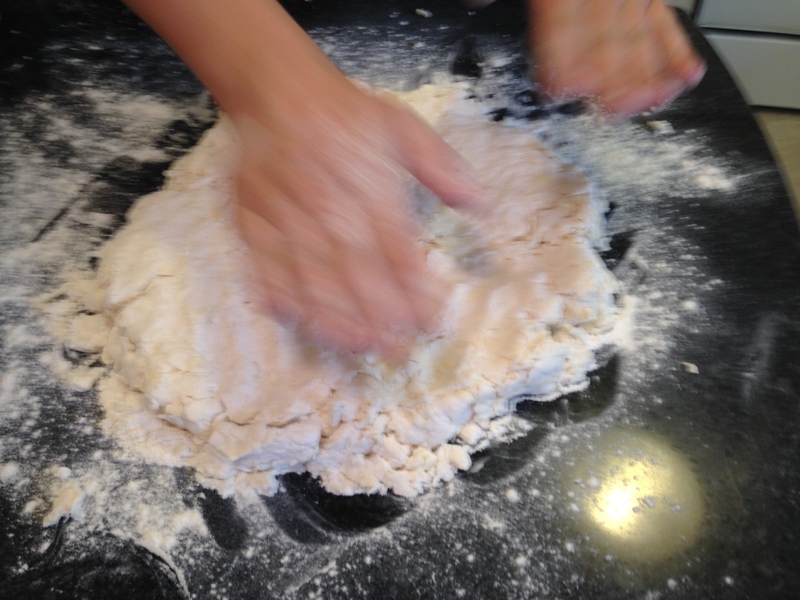 It has been some time since I’ve written a blog about food, so I thought I would share with you a big blunder I’d made a few days ago. On New Year’s Eve, my husband and I (mostly my husband) made a special meal of steak, lobster, asparagus, and mashed potatoes. It was delicious! We did, however, have plenty of leftover mashed potatoes (as is with most meals that includes this particular side dish). A day or two after the New Year dawned, I decided to do something with the mashed potatoes. 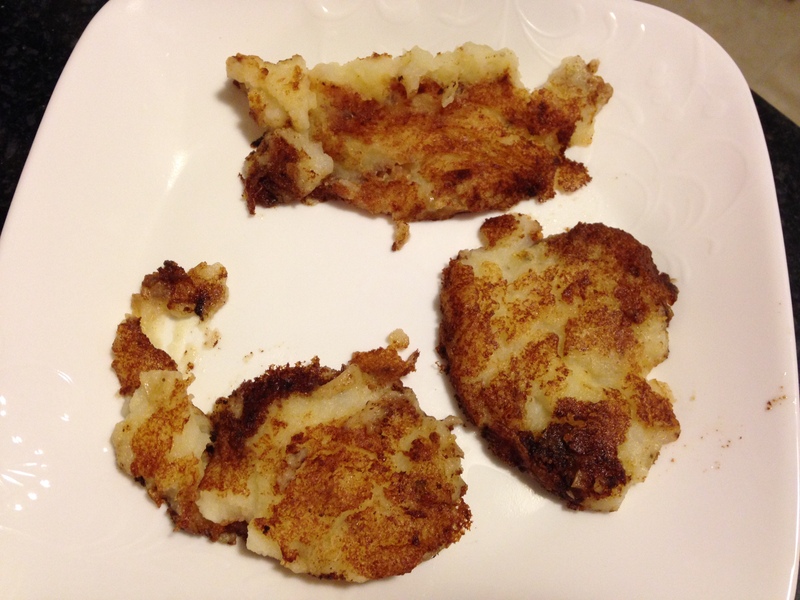 I had thought I’d seen an idea for potato patties somewhere on Pinterest, and I – foolishly – thought I could make them on my own without a recipe or any reference guide whatsoever. Yes. Foolish. 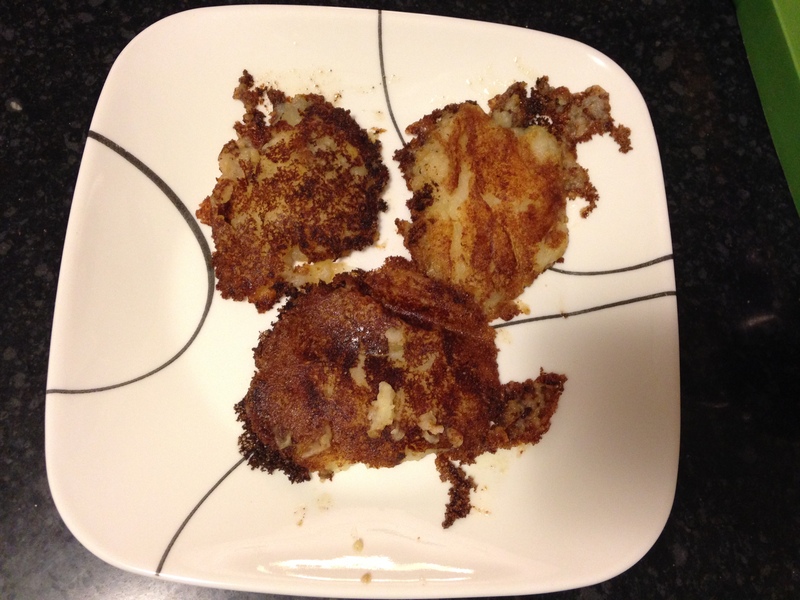 Alas, this is my attempt at potato patties. 1. Heat pan and put a chunk of butter in. 2. 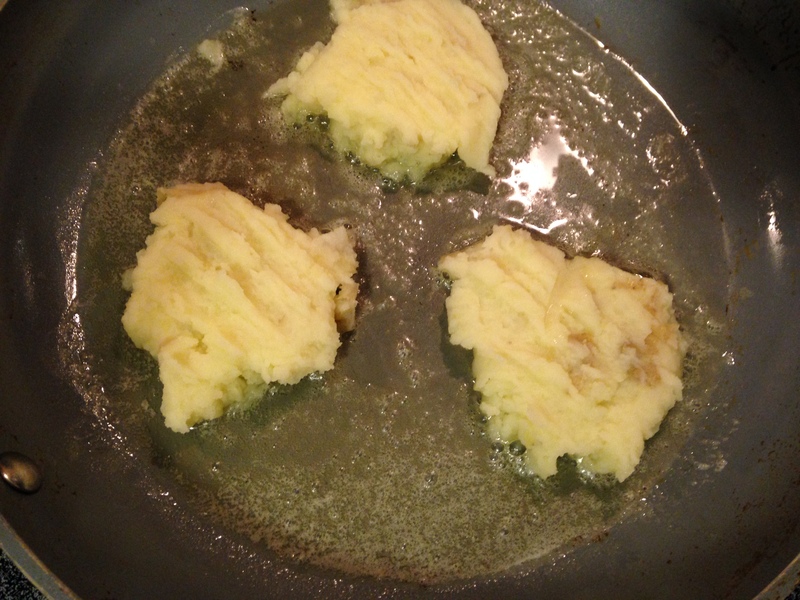 Once butter has melted and is bubbling, scoop mashed potato leftovers into pan with ice-cream scooper. Flatten with “flipper”. 3. Wait for a few minutes… or until you’re able to slide the flipper beneath the patty without it all falling apart. This is very difficult. 4. 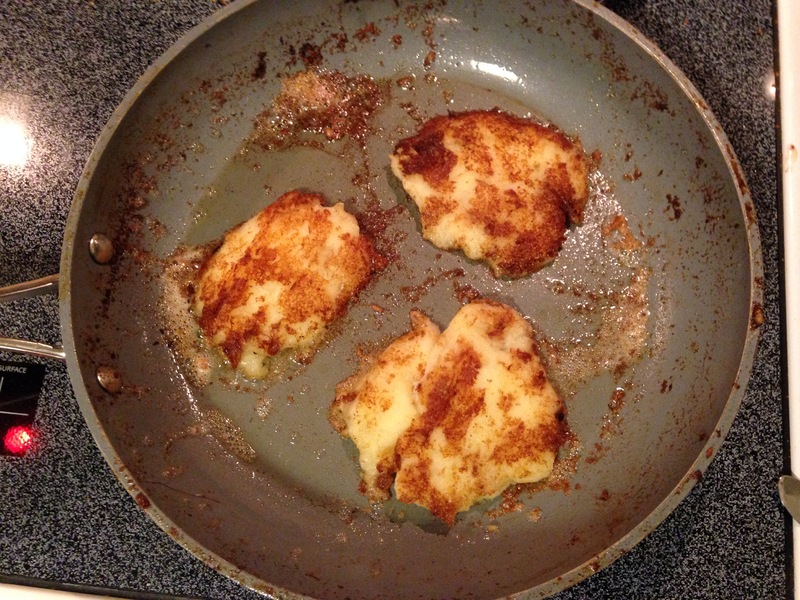 Flip patties and cook other side. 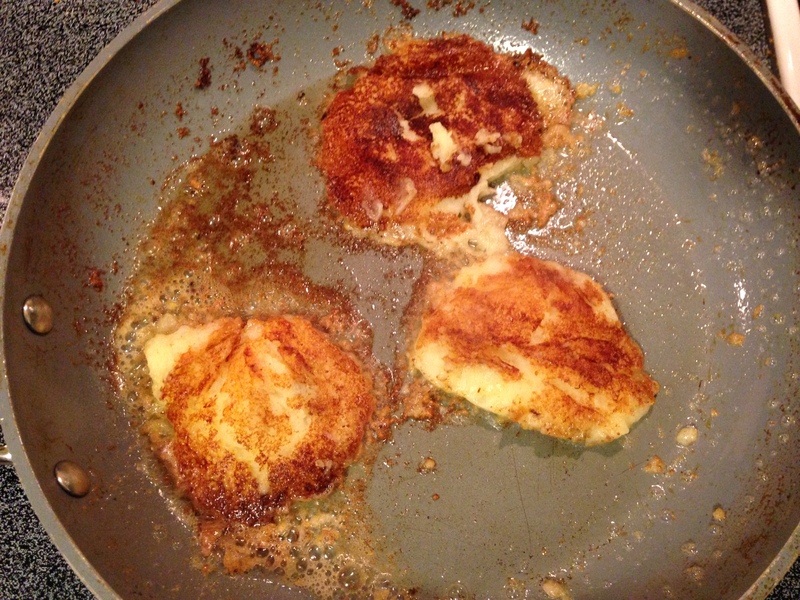 Final thoughts: In retrospect, I think the potatoes should be on the dry side and possibly thicker. 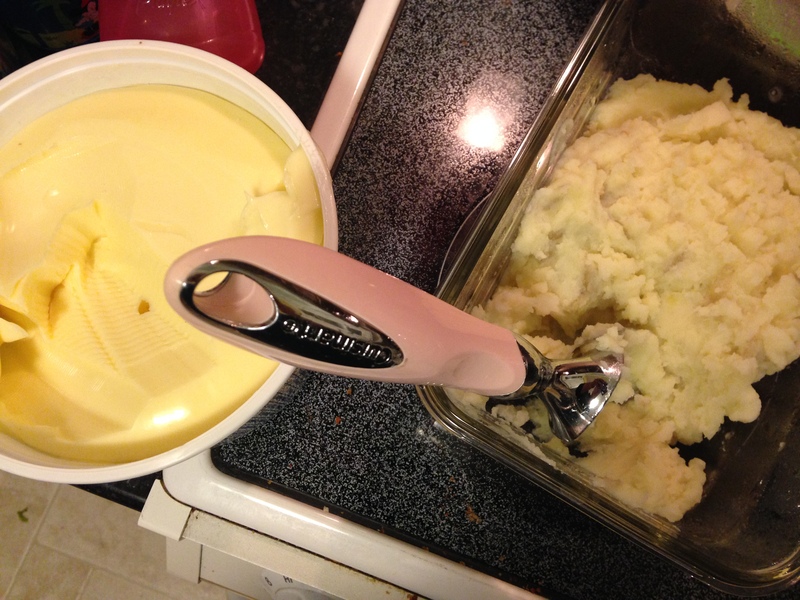 We like our mashed potatoes to be chunky yet moist, so we add a lot of butter in when we’re making it. 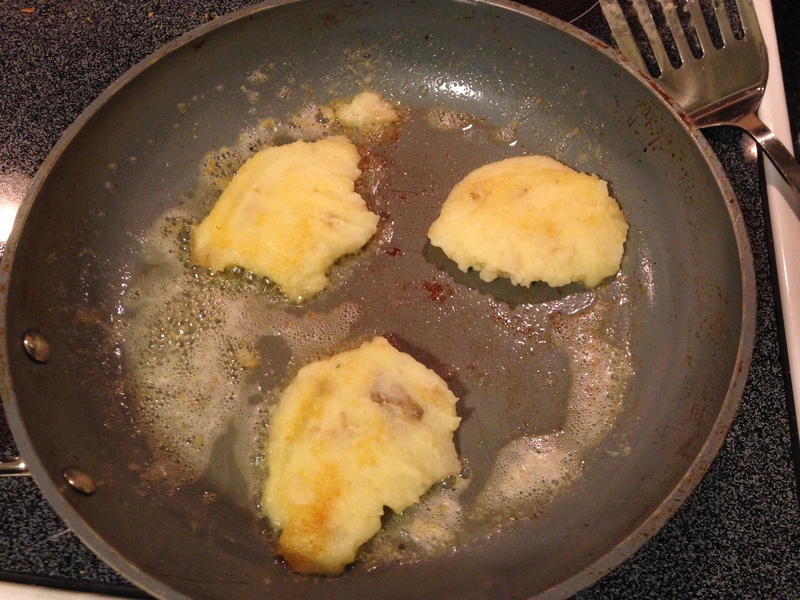 My thought is that if the potatoes are thicker and dryer, it’d be easier to flip them. I also think that adding flavour wouldn’t be amiss. These just tasted like our mashed potatoes. Nothing special. Honestly, I might as well have simply put the leftovers in the microwave and had them like that. This was a complete waste of time. Thank you for reading! Hope you’re all having a great New Year! Good morning, everyone! 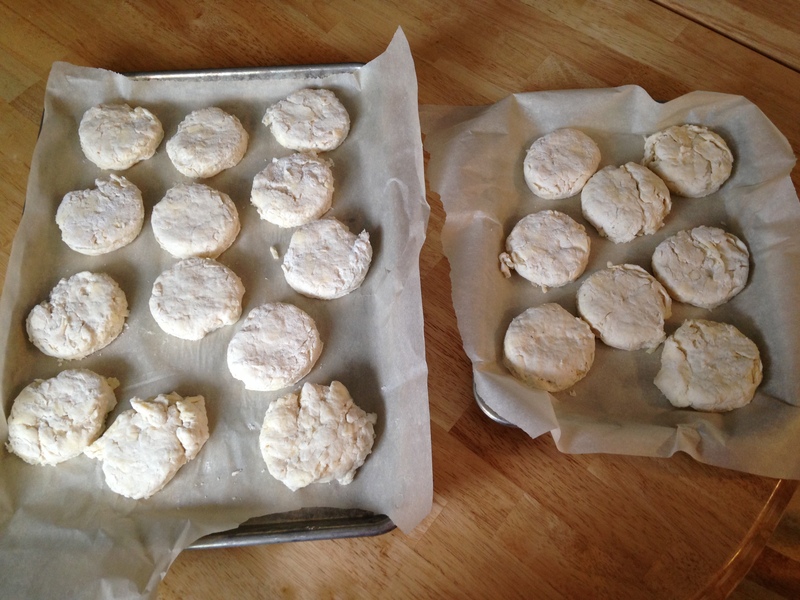 This morning I’m writing about the white cheddar biscuits that we added to our Thanksgiving dinner. 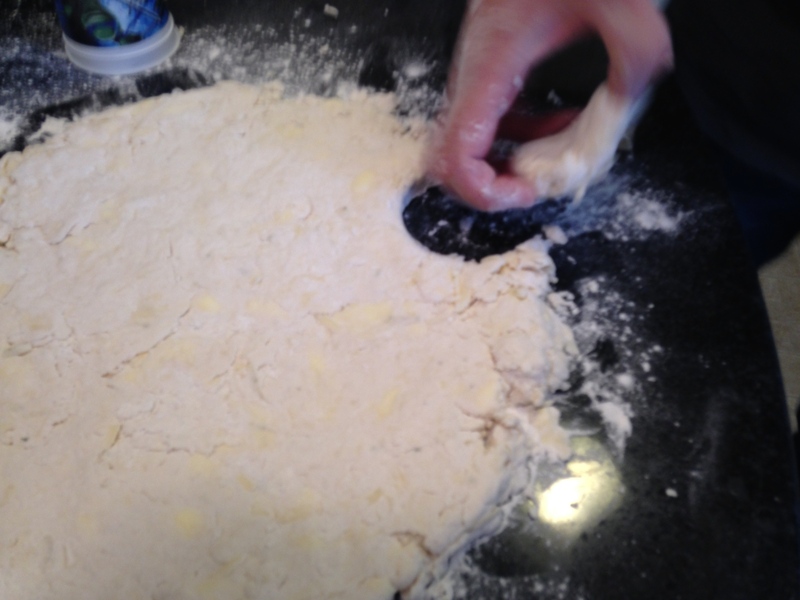 *Note: In the photo above, I had already added the salt and baking powder to the flour mixture. 2. 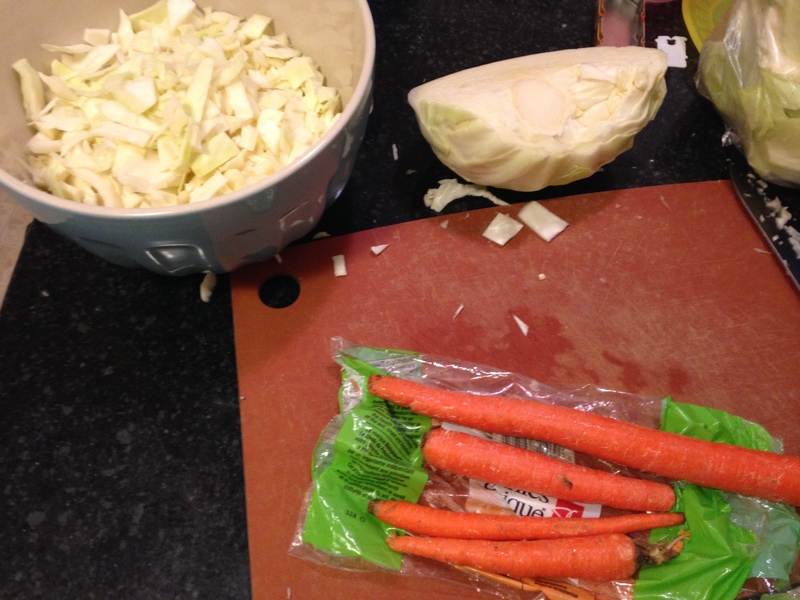 Cut in butter until it resembles coarse meal. Now, I had no idea what this meant, but thankfully my husband was around to answer my questions. I genuinely had no idea what I was doing or what this portion of my baking should look like. 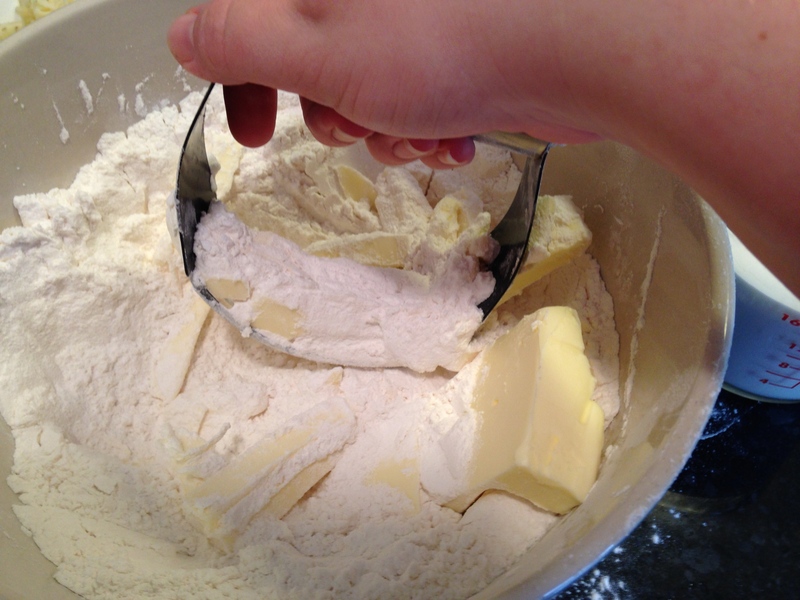 My husband said that I should do it quickly because you don’t want the butter to soften. He helped me quite a bit… I’m sure they wouldn’t have turned out as well as they did if he hadn’t been there to help me! 5. 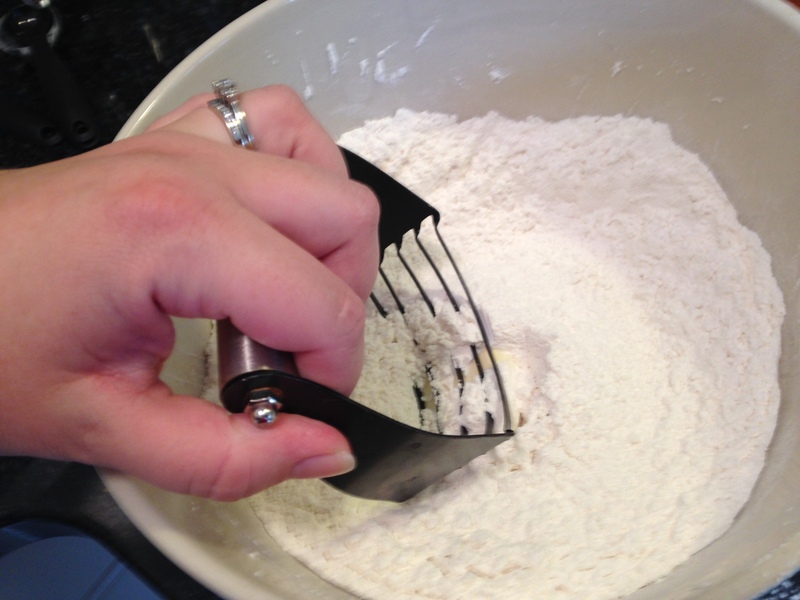 Mix quickly with fork until dough “comes together”. Again, I didn’t know what this meant. 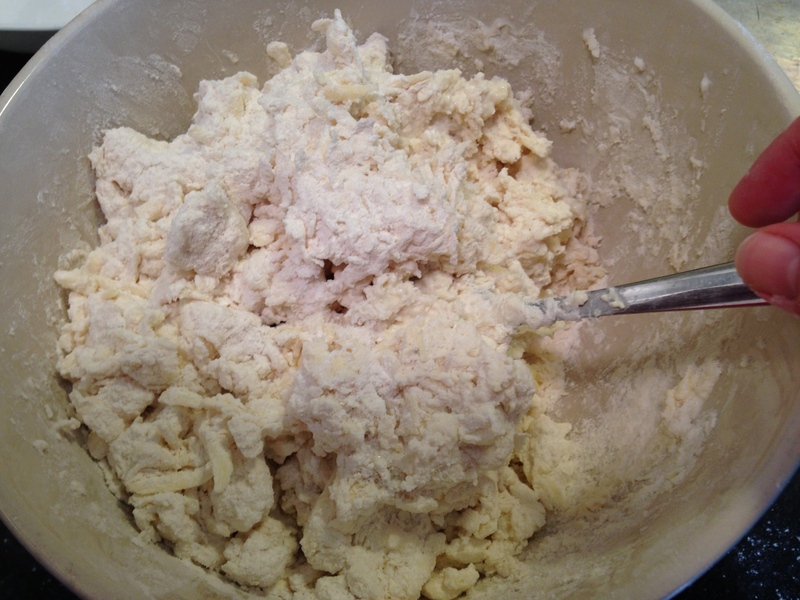 I couldn’t figure out why my dough was so crumbly and lumpy, so I kept mixing. Until my husband came in and saw what I was doing and took over. 6. 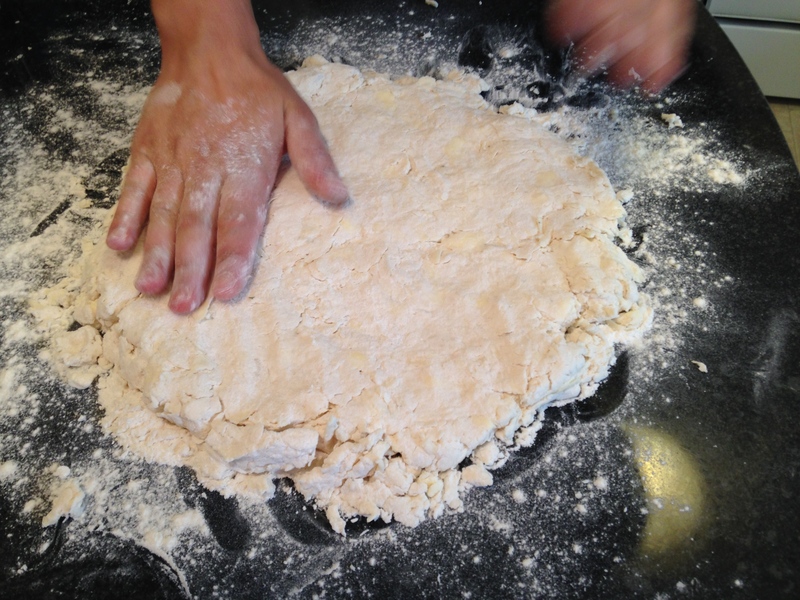 Using your hands, gently put the ingredients together. I think you can safely assume that I continued to have no idea what I was doing. Hubby moved immediately to the next step. 7. 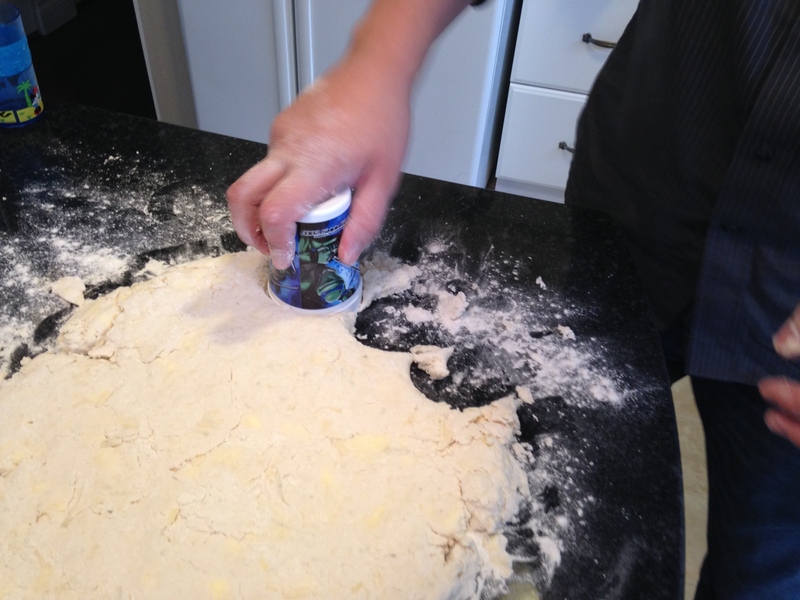 We dumped the mixture onto our counter and Hubby patted it down until it was about 1/2 an inch to 3/4 of an inch thick. 8. 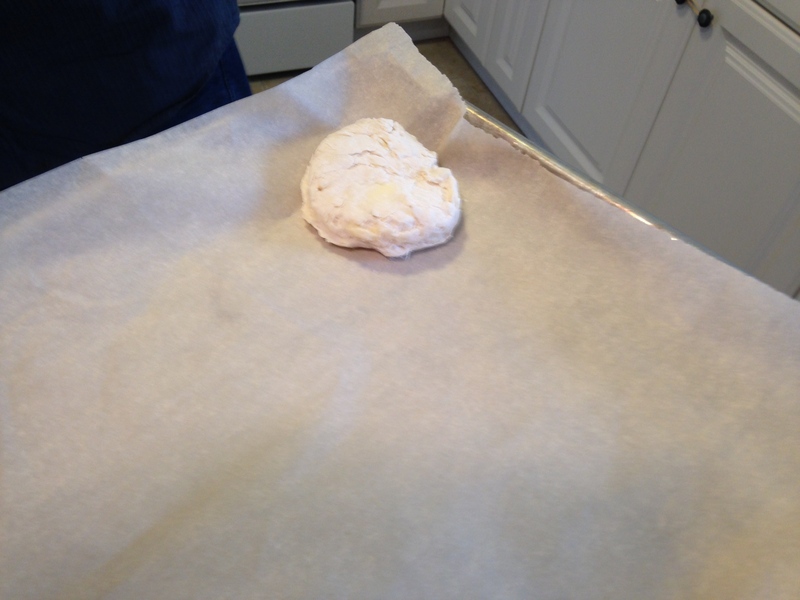 Use circular cutter (we used a cup/glass) to cut the dough into circles. 9. 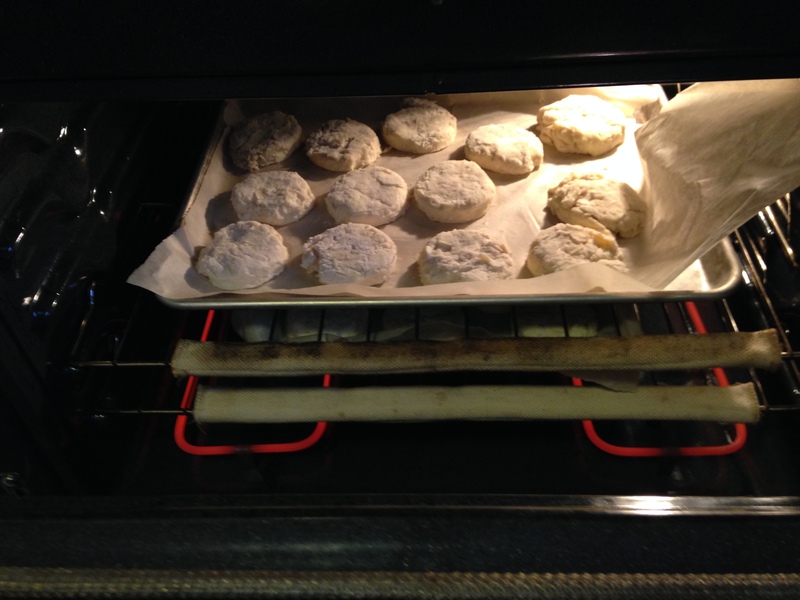 Put cut-out biscuits onto parchment paper lined cookie sheet. 10. Bake for 12-15 minutes at 450 degrees F. *Note: keep an eye on them after the 15 minute mark if, like us, yours aren’t quite done. 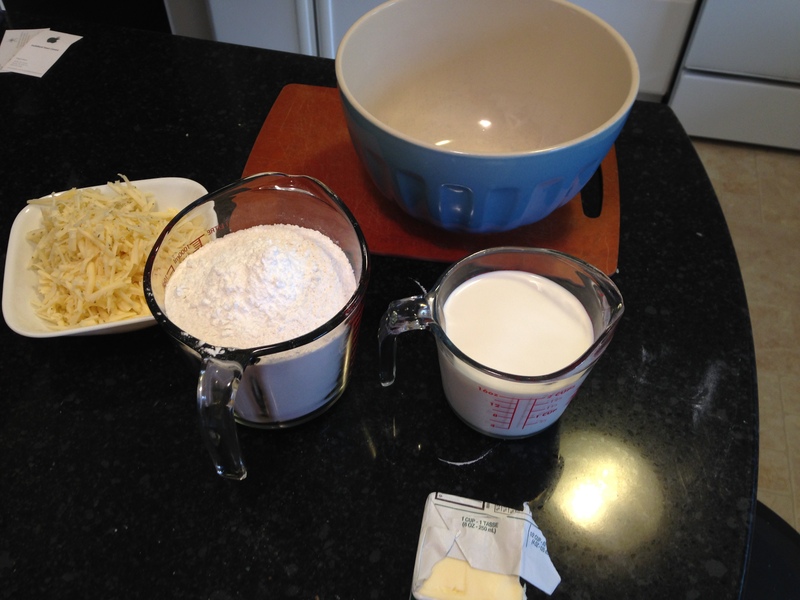 We watched until our white cheddar had darkened and then we removed them. 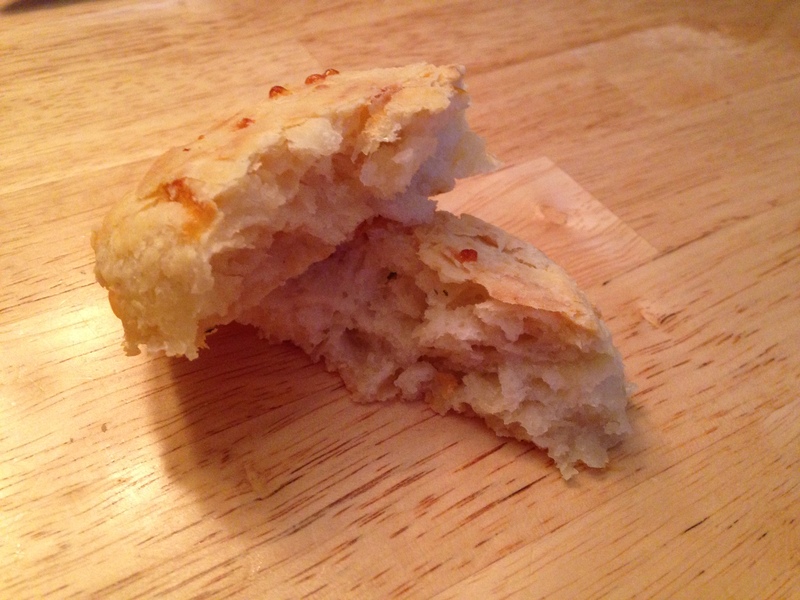 These cheese biscuits were delicious. Seriously delicious. The family we had over for thanksgiving dinner took seconds, thirds, even fourths of these. They’re great for sopping up gravy! 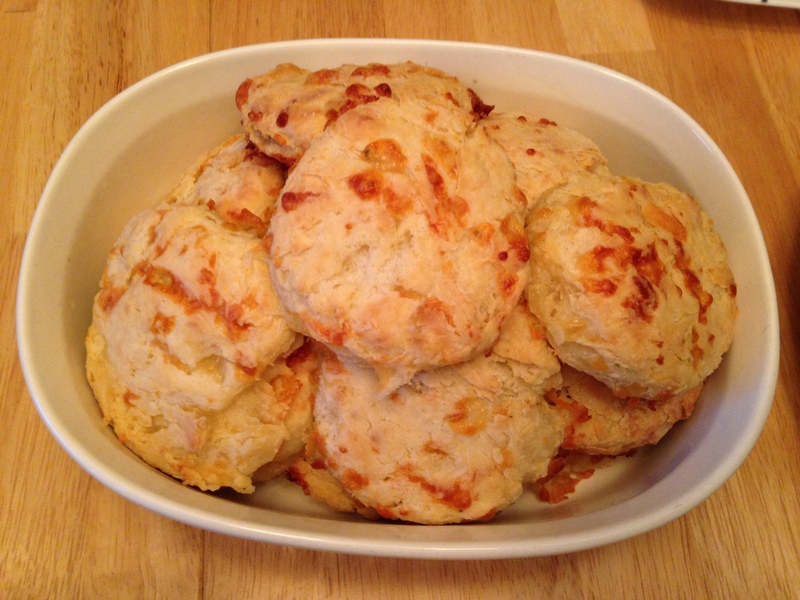 *Leftover biscuit recipe idea: A day or two after Thanksgiving, we still and a few (6 or so) biscuits left over in the fridge. With these, we (*ahem* I mean, my husband) made mini pizzas. Put homemade pizza sauce directly on top of the biscuit, added a thin slice of Hungarian Salami and topped it with shredded cheese and put it in the oven. So good! I desperately wanted more, but there weren’t any left. The kids loved it, too.